UPDATE: This contest is now closed. Congratulations to this week's winner, Dorothy Douglas! If that is you, please see our reply to your comment below to find instructions for claiming your prize. Thank you to everyone who entered, and keep reading the Homecoming Insider newsletter for more fun giveaways! Welcome to this week's Homecoming Insider giveaway! 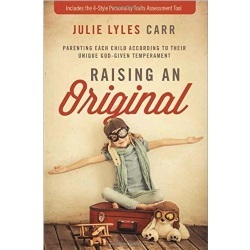 Enter now for your chance to win the book Raising An Original (Zondervan), from Julie Lyles Carr, speaker, blogger and mother of eight. To enter, simply comment below and let us know why you'd like to win this book. Only one comment per person, please! The deadline for entering is this Sunday, Feb. 5, and our winner will be randomly chosen and posted to this page no later than Tuesday, Feb. 7, 2017. IMPORTANT: If you are the winner, we will notify you ONLY by posting your name on this page and announcing it in the next Homecoming Insider newsletter. It is your responsibility to check back here on or after Tuesday, Feb. 7, to see if you are the winner and get instructions for claiming your prize. If the winner has not claimed his or her prize within two weeks, it will be forfeited and may be featured in a future giveaway. With a helpful and detailed Personality Trait Assessment Tool included as a major part of the book, readers will understand themselves, their parenting style, and their child better. They will also discover ways to improve their children’s communication within sibling groups and with parents themselves.